Need some inspiration for those long days at home in the summer holidays? Plenty of things require lots of money or a car of course but our five suggestions won’t need either. They’re simple childhood classics that children around the UK are still enjoying on their doorsteps. 70 ml Fairy Platinum Washing Up Liquid* (*we’ve tried others, this is the best)! Get a big wand and tray or make your own with string & sticks. Great fun in gardens and parks too. Who can do the best chalk picture? 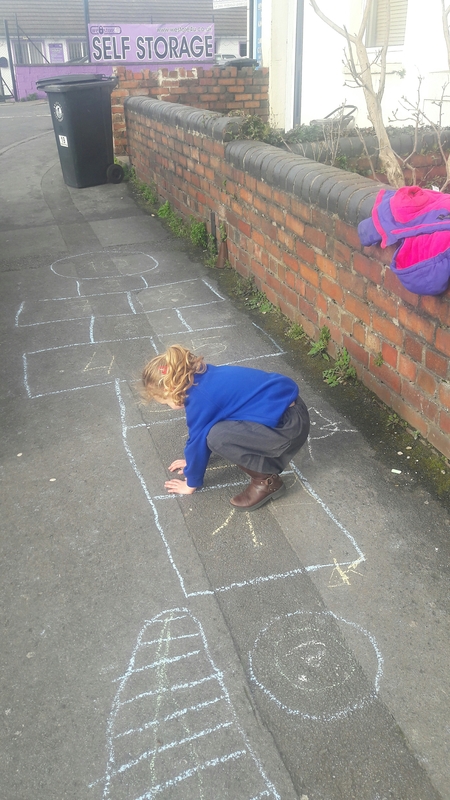 What about the longest Hopscotch – we’ve seen some ‘100-ers’ around our area this year. Or why not make up your own game? Chalk is brilliant: it’s cheap, colourful, fat or thin, and available in lots of big stores. It stays long enough to make a mark but washes off with rain or a bucket of water. Check out the Chalk Challenges that Jo ran at her local school for inspiration. A good one for a long day at home. Firstly, get together what you want to sell – another activity in itself. Our tried and tested ideas are: squash and biscuits or cake (home made sells well); ‘puddings’ made from mushed up fruit and sugar; perfume’ made from water and petals or any nice smelling stuff you’ve got hanging around; old toys and bric a brac; home-made drawings and paintings. Secondly, set up shop outside. A small table and chair work well or a sheet or towel to spread out your wares. Don’t forget to make your shop or cafe sign and to think about prices. Very cheap will mean more customers as people will buy things just to be nice to children. And even the quietest flats or street will have at the least some neighbours passing by. It’s a lovely way for children to engage with people and to learn through doing something real. Finally, count up your profit and decide what you want to spend it on – donation to the charity shop? Ingredients for your next cafe? Or ice cream – all the sweeter for having been earnt. Woodland and parks are wonderful for children, but they usually need parents or cars to help children get to them, if they can go at all. Nature on the other hand is all around us, even in the inner city, and the sharp eyes of children need only be tuned to find it: insects, birds, weeds and flowers growing through cracks, the sky… Early on in Playing Out’s journey, we held some nature hunting on the street and in front gardens and took some photos – have a look at both for some inspiration. The Wild Network has created the handy Wild Explorers App -its packed with over 100 activities for children of different ages. All this needs is some paper and crayons and the challenge to get as many different rubbings as possible from outside your home. Pavements, walls, lamp-posts, drain covers.. all give different patterns and shapes for adults and others to guess later.